Use the car hire price comparison website tool below to quickly find the cheapest car hire for Murcia in Spain in just seconds. The free price comparison search engine below will compare all the current Murcia car hire deals and car rental rates to give you the lowest and cheapest car hire for Murcia. The price comparison tool will compare all the latest Murcia car hire quotes and prices and car rental rates between the major international brand name car hire companies as well as national and local Spanish car hire companies saving you both time and money. It is free to use – just put in your dates for your car hire Murcia and tell us what type and size of car you want to hire – then let the price comparison booking engine do the rest! Hiring a car in Murcia is essential because of the lack of public transport. The only reason not to hire a car in Murcia is if you are staying in the centre of Murcia where everything you need such as shops and restaurants are within walking distance. If you are coming on holiday to Murcia you will probably be arriving into Murcia or Alicante airport where there are of course many car hire companies both local Spanish companies and major international car hire companies. In Murcia itself there are a number of local Spanish car hire companies, some are based only in Murcia and some are national Spanish car hire companies with branches in many towns in Spain. 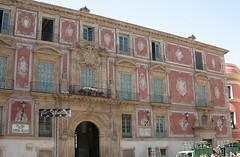 Hiring a car in Murcia gives you great flexibility to discover the many varied sights and towns of the Costa Blanca. HOW MUCH DOES IT COST TO HIRE A CAR IN MURCIA? Address: Aeropuerto San Javier, Carretera del Aeropuerto, Murcia Airport – inside the terminal building, Santiago de la Ribera. Murcia. From the 8th of October to the 16th of October i.e. 9 days Centauro will rent you a car from Murcia airport for a price of €160.20 for a Ford Focus CMax tdi or similar model and make of car. From the 18th of September to the 24th of September i.e. 6 days Goldcar will rent you a car from Murcia airport for a price of €66 for a Ford Fiesta or similar model and make of car. * What’s included in the Murcia car hire price and what ISN’T included. You can come across some very cheap Murcia car hire prices but they often won’t include unlimited mileage, local taxes or insurances. * When you hire a car or rent a car in Murcia always check whether the car has air-conditioning – especially if you are hiring a car in summer. * Book ahead. Murcia is very busy in the summer and Murcia car hire companies will often run out of cars for hire. You also tend to get a better Murcia car hire rate by booking in advance. * Don’t always choose the cheapest Murcia car hire. Rather than hiring a car in Murcia which you can barely fit into you will often find the price difference is usually small to upgrade to a more comfortable Murcia car hire. * Child seats. Many Murcia car hire companies do not always have these available – out tip is to take your own – you simply check-it in at the airport with your luggage and you will save on your Murcia car hire bill. * When hiring a car in Murcia check that what you have booked you receive when you are at the offices of the Murcia car hire company. Do all of this before you sign all the paperwork. Make sure you take any car hire print-outs you have so if there are any problems you have it all in writing. * Check your Murcia car hire for damage. When you’ve got to your Murcia car hire you naturally just want to get going but make sure the car hire in Murcia company acknowledge any bumps and scrapes already on the car. * Petrol. Make sure your Murcia car hire uses diesel not four-star petrol as it is much cheaper to buy diesel in Murcia. *Excesses. Some Murcia car hire companies have very high excesses which means you pay an amount (for example €500) if you have an accident and they cover the rest. Be aware of how much the excess is before you book your Murcia car hire. More useful tips on hiring a car in Spain. When you hire a car in Murcia you may be unfamiliar with driving in Spain and as well as risking your own life, you could be endangering others. Whether you are a tourist in Murcia or a resident of Murcia we highly recommend buying a book called Motoring in Spain which covers road signs, who has right of way etc – essential guide to driving in Spain.